Being engaged and living in two cities has its advantages and disadvantages. The disadvantages are clear: time, miles on the road, a goopy longing for one another, hours on the phone… yada yada yada – I know, it could be worse. The advantage is I can give you a full rundown of every Starbucks and Chic-Fill-A between Raleigh and Charlotte. Want a latte? Burlington. The one near the outlet mall. Just a cup-o-joe? Salisbury is best. Fresh chicken sandwich, skip I-85 exit 41. Plus it is way too crowded. With a multi-layered travel week ahead of me, I decided that perhaps Michelle and I would train down to Charlotte on July 2, I’d train back to work on the 5th and then drive back down for the weekend. Get a little work done while someone else chauffeured. Michelle and Julie had yoga/shopping plans for Thursday and Friday, so it made sense for me to get the heck out of the way and return to a light half-week at work. I waited to buy my Amtrak tix – I have travel transportation commitment issues. What if I change my mind? Plus, Michelle was babysitting for a family friend supposedly until 5 PM, and the train departed at 5:16. We’d be cutting it close. The plan was in motion. A click of the Uber App and five bags later, (one carrying a homemade ice cream churn – you gotta have homemade ice cream on July 4th) I was poised to depart waiting on Dellwood Drive. Our Uber was there in a flash. With an already full trunk, I crammed four bags in the front seat of his car and put the churn in the back with me. Still no Michelle. I called. I hated to make the driver wait any longer so I told him he could leave and opened the passenger door to begin unpacking. About that time Mr. Hill’s truck rounded the corner. Our driver took off, and I quickly booked the tickets on my phone. Raleigh has a brand new train station which is incredibly exciting. I had read in the paper that the station was opening on the very day we were leaving. We’d be on the inaugural 5:16 train. We drove up to the station. It was empty. The signage was sparse and not one single passenger was inside. “I swear I read it opened today,” I explained to the driver. “I read that too,” he assured me. I walked up to the door – it was 5:03 PM. A guy in a uniform was inside. He sauntered to the door. I ran back to the car, and we sped out to the Cabarrus Street station only a couple of blocks away. As we neared our destination, I got a text: Your train is delayed by an hour and 8 minutes. I guess that’s not all bad, I thought. At least we won’t miss it. We unloaded our goods and headed inside the hot, cramped room. Michelle purchased a drink from the vending machine and used the decades old bathroom. About five minutes later, I received another text. Your train has been delayed another 34 minutes. Had I driven, I could have been over half way to Charlotte by the time the train left the station. I went up to the counter. “Can I get a refund?” I inquired. $15.83 cents for the round trip Uber and an hour later we arrived home. Just in time to repack and leave again… in my car. Incidentally, I checked. We made it to Charlotte an hour and forty-five minutes before the train. I think we made the right call. I am definitely an extrovert. I feed off others’ energy. I’m pretty good at connecting with folks at a work function or a social gathering, asking questions of friends or acquaintances. And yet, I sometimes work to avoid strangers – it’s just hard to invest in people I’ll likely never see again. My fiance, Julie, apparently has a different mentality. There are many, many seats at the end of the bar. I could also read her response: Yes, but these seemed more interesting. By 10:45 PM, he had made suggestions about our menu options, he comes to that bar every time he is in town (he chose well); he offered to go out with me to hear music if Julie wanted was too tired to hit the scene; and he and I (NOT Julie) had become Facebook friends. When he passed her the phone to friend him, she handed it to me. He also mentioned something about tattoos, but I think I zoned out during that portion of the conversation. And sure enough, when I checked my Facebook feed the next morning, there was Huey, shirtless, with a tattoo of a jazz musician covering his right shoulder. Our time with Huey is not a novelty. Last year in San Diego we met Victoria and Ozo, a very fit couple our age, when Julie asked if we could sit by them at a courtyard bar. It was cold, and they were near the fire. Ozo and Victoria had merged families and wanted to meet the next day to coach us on life as stepparents. Together they had six kids. We met. They coached. In Spain we spent time with Sandra who hauled us to her apartment where we met Hugo from South America and learned to flamenco dance on her ground floor outdoor patio. At the time, Sandra was dating a Frenchman ten years her junior. They didn’t speak the same language. I told her it was never going to work. But we will never know because she is a stranger who lives in Spain. Although this excessive interaction is uncomfortable for me, I’ll have to say it is interesting. It’s sort of like adding a little spicy pepper to fettuccine Alfredo. It’s good on it’s own, but the occasional flavor adds an unexpected zing. I anticipate A LOT of zing coming my way. If it wasn’t going to break in half due to a massive earthquake, I would move to San Diego. I just spent three days there for a meeting and man, is it a cool place! I first noticed the difference at the airport. I take people watching very seriously when in public places. And the people I watched in California were all beautiful! The women AND the men! I saw very few who were overweight. Folks were walking around the airport with skateboards in tow and muscles bulging. I swear that the Dali Lama and Shirley McLean were on my flight from LA. “Shirley” looked to be a healthy seventy-something-year-old. She sat in an airport chair wearing culottes with her legs tucked up under her behind. She was more limber than my 13-year-old daughter. Although she had a bit of dangly skin on the underside of her arms, and who doesn’t at that age, her biceps looked as if they could easily hold the weight of her body in an upside down split on a balance beam. These Californians dressed casually, had unusually bright colors of hair, and seemed to enjoy open toed shoes. There weren’t a lot of wing tips strolling around LAX, it was FLIP FLOP haven. The lush plantings all along the 15 minute drive to my hotel were beautiful. While it was a balmy 95 degrees at home, we ate outdoors each evening with a slight breeze and a refreshing temperature of 70. I will admit, the local newscast took some getting used to. One reporter shared that a man had been shot by his car while meditating on the side of the road. Thankfully, he was going to be OK. I wonder why he stopped his car on a seemingly busy highway for quiet and relaxation. Perhaps the traffic was stressing him out. I haven’t seen that many people mediate on the Raleigh Beltline, but I might try it. The weather woman for the morning broadcast wore a short, puffy, bright pink skirt. Her black blouse was fitted – VERY fitted (and there was a lot to fit.) I sort of felt like Katy Perry was delivering the five day forecast. Oh, and I swear she was wearing medium length black socks with her high heels. It was early, and they only showed her feet once. Maybe that was just a dream. High heels and socks? That’s not something you see at the Fayetteville mall much less on the news in North Carolina. I return next year for a conference, and I think I’ll stay a while. Just breathing their air makes me feel all tingly inside. I guess that other families do this too but perhaps we are an anomaly. If they don’t, perhaps they should. The smallest, stupidest, things can bring our simple minds so much joy. 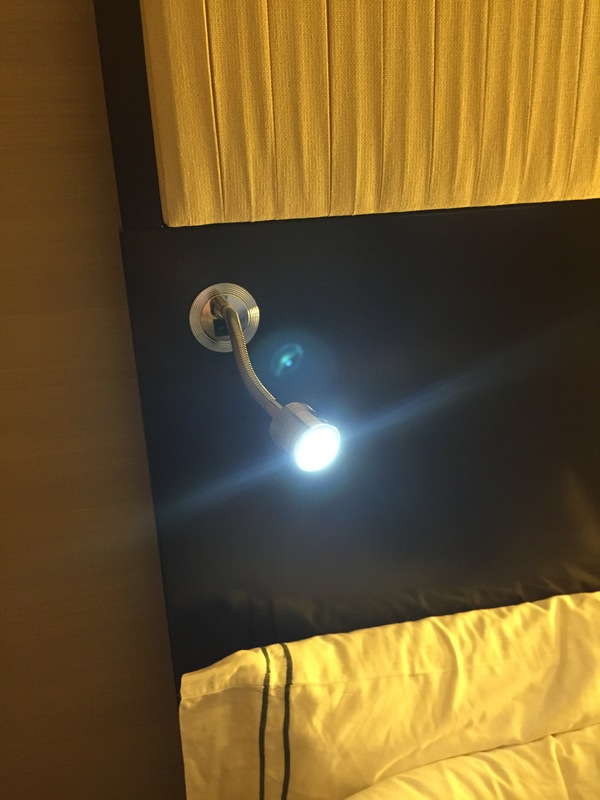 Last week when visiting DJ in DC, we discovered that our reading light, when turned the right way, was equivalent to a Broadway Show spotlight. A Tanner just can’t resist the limelight, even if there is but an audience of three! This is our rudimentary work. We call it A Night at the Hamilton, the name of our hotel. Since Michelle didn’t go to Camp Seafarer this summer, she’d spend several weeks with grandparents and we’d take the money we saved for a sitter and invest in an inexpensive trip – just the two of us. With racked up airline miles, the only costs I’d bear would be the hotel, food and entertainment. We decided on New York – one of my favorite places. Not cheap, but I am! 1. Stayed at the roach motel – book late, great deal. The room had apparently been the previous home of a drug bust. The screws on the safety lock were dangling out of the woodwork – clearly the victim of an NYPD midnight intrusion. Lots of cars backfiring??? Just pretend you left the TV on and there’s a Starsky and Hutch marathon running all night long. 2. Carry your own bags. Everyone in New York wants a tip! A big reason to live in the south. Angry stares from the hotel staff. Hail your own cab on the way back to the airport brother! No response when you report the broken safety lock. 3. Subway or walk. No taxis. Unfortunately, Michelle inherited her paternal great grandmother’s aversion to germs. As soon as we got to our destination, wherever it was, she’d ask me to go wash my hands. We’re going to work on that prissiness. I could have been beaten up. Teaching her to read a Subway map. Took up lots of time! Visiting the store Mood in the Garment District. They sell ribbons for your hair, thousands of them – some are $2.50 a yard. 1 1/2 hours – check! Macy’s – have to buy some back to school clothes anyway and they give a 10% discount to out-of-town customers. Split a phat piece of NY cheesecake! $8 and good eatin’. We did do some stuff that cost money. 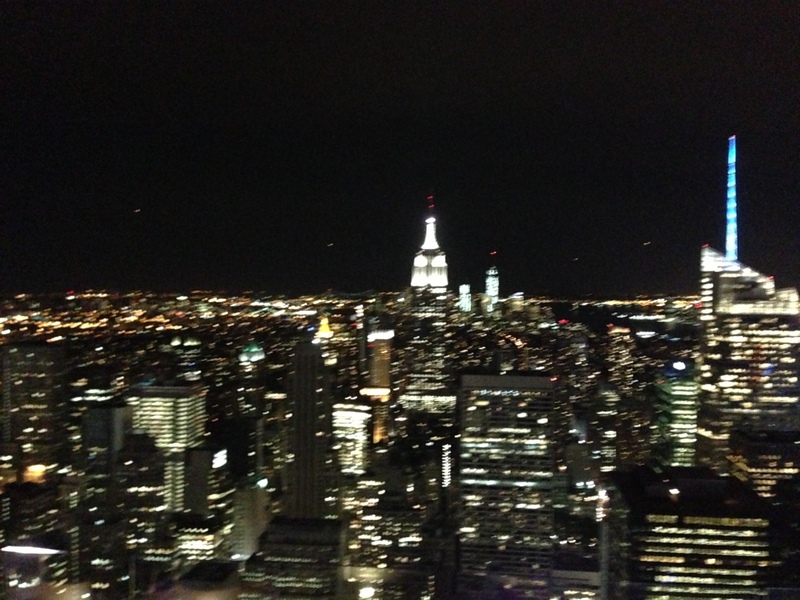 We saw Matilda and went to the Top of the Rock at night and both were fantastic. The looks on her face as she experienced the city were priceless: the edge of her seat in Matilda; her mouth wide open at the top of Rockefeller Center; her eyes bugged as she entered the ribbon room at Mood. I’d pay $10,000 to see those again. As much as I love Manhattan, the highlight of the trip had nothing to do with New York. It was spending time with my kid, just us – laughing and discussing life. Now I have to figure out a way to do the same with the other two. Does God send signs? I’m just not sure. I told Lisa before she died that if it was at all possible to come back and visit, I expected her to make that happen. She told me she would not – she said she didn’t want to be stuck between here and there. When she went, she was diving in with both feet. But I sure have had some peculiar things happen since February 2010. In June of 2009, three months before Lisa was diagnosed, her father took our entire family on a trip to Yellowstone. About every three years he plans an incredible vacation where we laugh, grow closer and build significant memories. In preparation for the trip, Lisa had t-shirts made up. On the front it said, “The Katsopolis Family Tour.” On the back, there was a list of places we’d been and the year we’d traveled. The last entry on the tee was: Hawaii, 2012. That was Lisa’s way of encouraging her dad to keep the tradition going. These truly are special occasions for our family. So in true family tradition, Pops, as all the children call him, planned an incredible ten-day stay on the big island of Hawai’i! We just got back. Interestingly enough, a bird had flown into our vacation home the same day that Kathy had the dream. The bird flew in a second time later in the week. And to top it off, as I stood on the lava rock in front of our house, a bird flew so close to my arm that I could feel a sharp breeze from his wing. It startled me. It almost felt like he touched me, but I didn’t see him until after he began flying away. In no way do I believe that my wife has been reincarnated into a bird. And I have absolutely nothing that could make me say the dream and our three encounters with Hawaiian fowl were anything more than coincidence. And yet, I found it comforting. Maybe Lisa did turn rouge bird for a week. Or maybe it was nothing. Or maybe in some small way it is a sign, sent to me, to let me know she is OK and that she approved of our family’s time together. 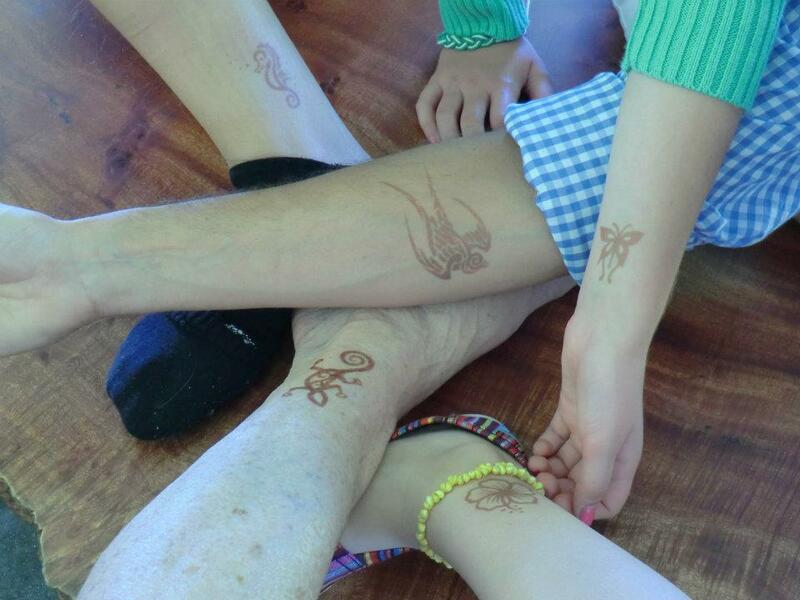 In honor of our time, my mother-in-law sprung for Henna tattoos for the girls, and yes me. Mine is the bird. So I forgot her underwear and bras, what’s the big deal? I was in a rush. The kids usually help me pack their bags for our weekend jaunts. Last week there simply wasn’t time. I had to go it alone. Stephanie and Michelle receiving an incredible education on Friday at school while I stuffed the Totes. I remember at one point, while digging through Michelle’s shirts, thinking, “You haven’t gotten underwear.” I headed to that drawer and threw a few pair in her bag. But when I hit Stephanie’s room, my main focus was picking outfits she’d be seen in. Underwear were not a part of my mental picture. When we arrived at our destination, clothes started flying. She dug to the bottom, opened all of the side pockets. No sign of undergarments. I was in the shower when I heard the scream. Ohhh. Stay in the shower. It’s nice in here. I think that struck a chord! It was ego, sure male ego that made me do it. Stephanie was invited to the lake with friends for the weekend and DJ, Michelle and I were looking for an equally exciting activity to fill our Labor Day hours. 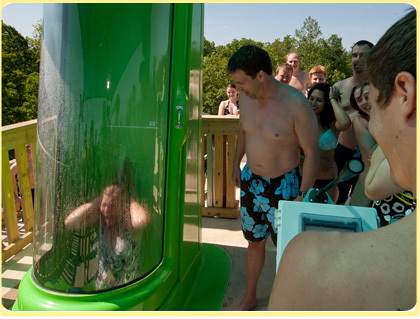 As I pondered our time, interests and finances, I landed on a day trip to Water Country USA in Williamsburg, Va. Not too close, not too far away and an outdoor experience (versus the indoor Great Wolf Lodge disaster from February) was all too appealing. With some coaxing, Jesse decided to come along for the ride. The pinnacle of excitement for me came at 5:45, fifteen minutes before park closing. We had walked by Vanish Point, a slide that takes off from a 75 foot tower nestled in the back corner of the park, several times during the day. This was the description on the sign at the entrance to the attraction: Get ready for the ride of your life on Water Country USA’s epic new drop slide: Vanish Point. Inspired by the point on a wave where water and gravity form a perfect partnership, this summit supplies a wicked wet way to drop out of sight. You can step into a skybox where you fall down when the floor drops out beneath you. Although I was curious, had Jesse not been there, I would have kept my 45-year-old, ground loving self at the bottom of that tower of terror. But once he decided to take the plunge, my ego simply wouldn’t let me sit the attraction out. “OK.” He turned toward the long staircase. We started the climb up the mountain of stairs. My knees a bit wobbly from fear; Jesse and I tailed a gaggle of 9-year-old boys – excitement buzzing around them like bees on a honeysuckle vine. Not only was I motivated by wanting to keep up with my brother-in-law, but there was also something motivating about this group of kids. I could picture myself with Adam Fair, Jimbo Martin, the Mask boys and my brother – the Berkshire Road Gang – from my childhood. If we’d only had the chance to conquer this challenge as kids. Our closest adventure to Vanish Point was jumping off the dead tree stump in Adam’s yard with the sprinkler gradually dampening our bodies. I had to do this for them. The anticipation was palpable as we reached the staging area. We were so high, I swear I could see Mt. Rushmore in the distance. An attractive college student in her bathing suit was at the helm. One by one she loaded the boys into the Star Wars type tomb of doom. My turn was nearing. She opened the door. I gently pressed on the mechanical floor with my foot to make sure it was locked. I knew within seconds it would fall out from under me, dropping me to what could be my death. I climbed in – glancing at the lifeguard – a nice final image if this was the end. I had entered an upright coffin, albeit a wet one. She closed the door. The male guard at the controls glance toward me, my hangman. I was guilty. Guilty of stupidity. Whoomp! The floor vanished. My body darted down like a missile heading toward Cuba, my stomach lodged beneath my tonsils. I tried to open my eyes but the force was too strong. Within seconds I was at the bottom, water permeating my body through every orifice I owned. Stand up quick man! Look cool. People are watching. You’re wet all over, they can’t see the tears. An unconvincing, “It was great” fell from my mouth. This post is dedicated to my daughters who I’ve cracked on mercilously through the years for inconvenient bathroom stops. I was trapped! Heading down I-95 North to West Virginia, it was 9 pm and I was alone. The kids rode with the grandparents earlier that day. I was ready for the six-hour drive, my i Phone newly filled with 1,900 of my favorite songs. Kenny Chesney keeping me company. I knew the urge to tinkle was coming, but I didn’t realize the traffic that was in front of me. Nor did I understand the lack of exits between Richmond and Fredericksburg, Va. I was in a hurry. I’d heard bad things about stopping at rest areas at night, besides, the next one was 43 miles away. There seemed to be no other option. 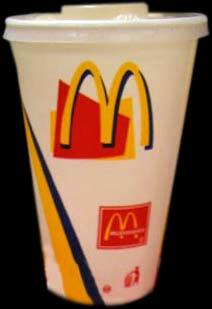 I eyeballed my McDonald’s cup. Yep, I still had the lid. I didn’t realize how difficult it would be while in transit. Moving, while moving, is nearly impossible. I drank the last bit of Diet Coke and strategically placed my fountain drink holder. Stop , then go – there were brake lights everywhere. I glanced at the cars around me. It was dark, the semi driver next to me couldn’t possibly see. I’m sure he’s done the same thing, he drives for a living! Almost…then a horn. I’d forgotten to press the gas and was lagging behind the car ahead of me. I sped up, my bladder contracted. Think about something relaxing. A day on the beach – not helping! I don’t do that on the beach. Picture the bathroom – yellow walls, a window, a tan tile floor. Whew… relief. Oh no, the cup is filling yet I’m not empty. Can I stop mid stream? No wonder girls pee in their pants. Sometimes there just isn’t a better option.